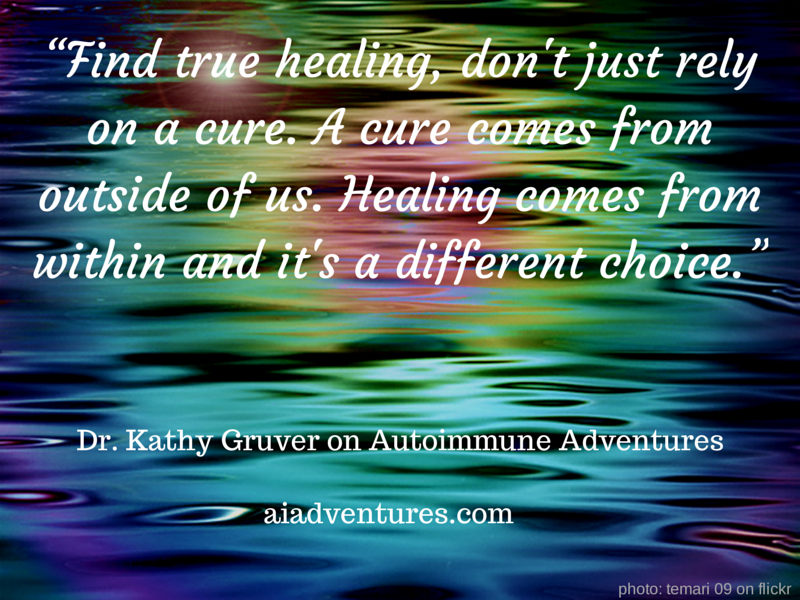 Subscribe to Autoimmune Adventures on iTunes. If you like what you hear, leave a review! Thanks in advance. How can you better manage stress in order to heal? By some estimates, stress is responsible for 60-80% of doctor visits. When you have an autoimmune disorder, stress can cause flares and exacerbate symptoms. Taking a proactive approach to stress relief allows the body-mind to relax and heal. 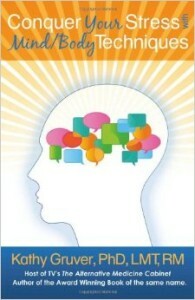 Dr. Kathy Gruver joins us again on this episode to talk about the stress response. 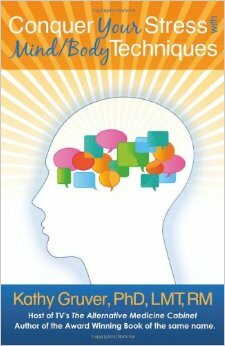 Author of Conquer Your Stress with Mind/Body Techniques, Kathy shares her thoughts on the mind-body connection and how to better manage stress. Using examples from her own life and practice, Kathy pinpoints the importance of making positive choices to change your experience. 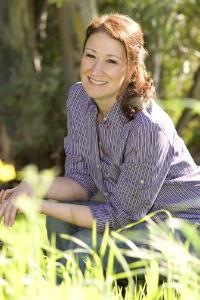 Kathy Gruver is an award-winning author and the host of the national TV show based on her first book, The Alternative Medicine Cabinet (winner Beverly Hills Book Awards). She has earned her PhD in Natural Health and has authored two books on stress: Body/Mind Therapies for the Bodyworker and, Conquer Your Stress with Mind/Body Techniques (Winner Indie Excellence Awards, Beverly Hills Book Awards, Global E-book Awards, Finalist for the USA Best Books Award). She has studied mind/body medicine at the famed Benson-Henry Institute for Mind-Body Medicine at Harvard Medical School and pursued further education at The National Institutes of Health. Gruver has been featured as an expert in numerous publications including Glamour, Fitness, Time, More, Women, Wall Street Journal, CNN, WebMD, Prevention, Huffington Post,Yahoo.com, Ladies Home Journal, Women, Massage and Bodyworks Magazine, and Massage Magazine. She has written dozens of health and wellness articles and contributing posts. Dr. Gruver has appeared as a guest expert on over 250 radio and TV shows including NPR, SkyNews London, Morning Blend in Las Vegas, CBS Radio, and Lifetime Television, and has done over 150 educational lectures around the country. For fun and stress relief Dr. Gruver does flying trapeze and hip hop dance. Kathy is sharing a short audio where she guides you through the mini-meditation described in the episode. If you would like to receive this gift, sign up for the free AI Adventures Club by entering your email address on the form on the top right of the page, or by clicking here! If you liked this episode, please subscribe to the podcast through iTunes, and consider leaving a rating and review! Reviews and subscriptions help boost the standing of the podcast in iTunes, which helps others who might benefit from the information to find it and join the adventure. See this post for instructions on how to subscribe and leave a rating/review. Thank you! mind-body connection, stress, stress relief. Bookmark. The Autoimmune Summit is almost here! Join the AI Adventures Club! Join the AI Adventures Club here! The information included on this site and in the podcast Autoimmune Adventures is for educational purposes only. It is not intended nor implied to be a substitute for professional medical advice, diagnosis, or treatment. The reader/listener should always consult his or her healthcare provider to determine the appropriateness of the information for their own situation or if they have any questions regarding a medical condition or treatment plan. 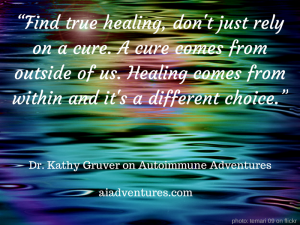 Thank you for visiting Autoimmune Adventures! If you know anyone else who might be interested, please share! Hope to see you again soon.